Exploring Sonoma Valley Wine Country - On a Segway! Thankfully, my traditional tastes only apply in the tasting room and not to the method of transport used to get there, because I arrived to each vineyard on the back of a wild electronic steed, more commonly known as a Segway! My dad had some about-to-expire coupons he'd bought on groupon for this wine tour by a local firm called Segway of Healdsburg, so he insisted I use them. "Ok, If you insist," was my reply. The tour started off in a park and ride parking lot in Healdsburg, right off HWY 101. The Segways come to you in a van, charged up and ready to go. They guides teach you how to ride in the safety of the big empty parking lot, which was great because I had never been on a Segway before, but thankfully it was super easy. We took a quick trip up a side street to make sure our Segwaying skills were up to snuff, and then we were off! 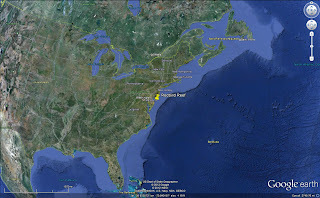 Location of the tour's starting point in relation to the bay. and forth in the parking lot! And the side road we practiced on. After getting the hand of it, we headed down a main road to Limerick Lane, a quaint country road dotted with small vineyards. Segways are legally bicycles, so we stuck to the bike lane, but boy did we get some funny stares from passing motorists! Aerial View of Viszlay Vineyards. Our first stop was Viszlay Vineyards. John, the owner, conducted our tasting himself around a shady outdoor table adjacent to the fields of vines. John told us he is a recent transplant from Chicago who decided to try his hand at wine making, and boy, he is doing something right! I am not a fan of Chardonnay, but we tasted a Chardonnay so crisp and delicious that I had to purchase a bottle. It felt great to buy something in cash directly from the person who had made it - this is how agriculture should work! And of course, we got him to sign the bottle. Aerial View of Limerick Lane Cellars, with its bottle-shaped pool! 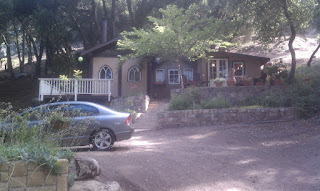 Our second and final stop was just down the road to a place called Limerick Lane Cellars. The tasting room here was much more formal, with dark woods and ornate decorations. The tasting assistant was very helpful and knowledgeable, and he gained my respect with his honesty; his personal favorite on their tasting list was also the cheapest, so he didn't seem to be trying to upsell us. Limerick Lane Cellars has been around for a while; some of their vines have been producing grapes since 1910! These old vines are unique because they were keep alive during prohibition when most grape vines in the area were ripped out. Due to their age, their roots reach down to the groudwater, meaning that these vines are non-irrigated. The reliance on groundwater gives the fruit a special kind of taste which you would not get with irrigated vines! We ended up buying a bottle of Zin from vines planted in the 1930's, and I cannot wait for a special occasion to drink it. Overall, the Segway tour was a blast! I'd highly recommend taking the tour with Segway of Healdsburg, but even if you go it alone to Sonoma Wine Country, be sure to stop by Viszlay and Limerick Lane Cellars! Click here for photos of the trip taken by our tour guide! Here is an interactive map of our route: The pins show the starting place and the location of both vineyards. Click on them for more info! It appears that States, Counties, and Cities are having a smaller and smaller influence on the development of the United States. People today commute father to work than ever before, and in most central cities hold much less relevance than they once did. 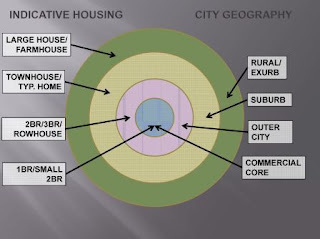 Suburbs and Exurbs have spread the population across huge areas such that it is often difficult to distinguish where one city or region ends and another begins. Historically, the central business district of a city demanded the highest rent and therefore was home to highly productive economic activities (technology, manufacturing) and small, expensive housing units (apartments). As distance from the city center increases, housing costs typically decrease and economic activity becomes less dense and lower profit. Housing Availability vs. Distance from city center. Once the industrial revolution and the automobile made commuting either, both residents and business fled the city for cheaper rents out in the country. The megaregion is the natural extension of this trend: proximity to a major city center is having less and less affect on locations selected for homes and businesses, and workers are increasingly expected to commute long distances or work remotely. Instead of defining areas by city or county, it may be more accurate to group areas into larger, inter-state 'regions.' Recent research by the America 2050 initiative has concluded that eleven so-called 'megaregions' are poised to become the default unit for grouping people and places. Essentially, a megaregion is anywhere with strong ties to surrounding areas. 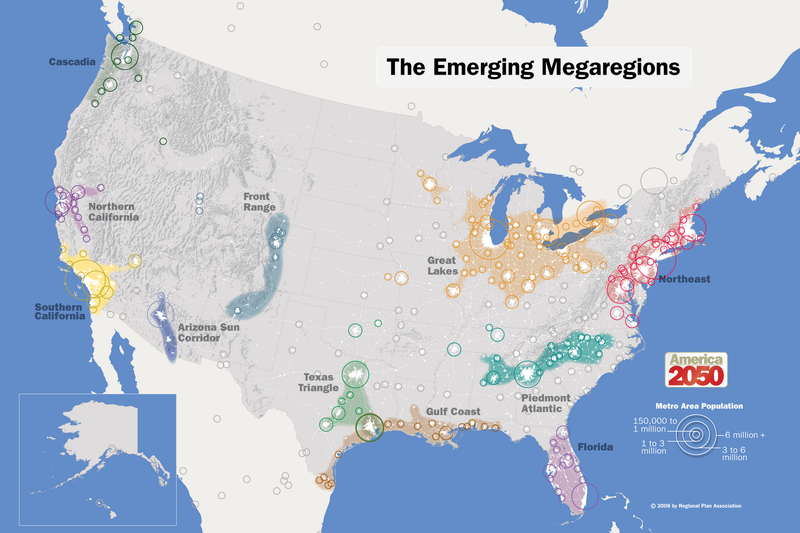 Megaregions are seperated by areas of low population density and less progressive economic activities. The map below really shows that the vast majority of land area in the United States has little to no population. Shaded megaregions account for 26% of land area in the U.S., but over 74% of the population! Viewing Megaregions as cohesive units can allow for more effective urban planning, as it allows entire urban ecosystems to be taken into account at once. In the day and age of megaregions, planning for a single city or country simply does not make sense anymore, as good urban planning requires every aspect of the urban ecosystem to be evaluated and accounted for. I am taking UCSB's Intro to Geology class this summer, and we just went on our field trip to observe geological formations in the Santa Ynez mountains. The trip really helped me understand the formation of rocks, mountains, and valleys; geology is a lot easier to understand when observing it in the field than learning about it in the classroom. Our class piled into vans and went up Gibraltar Road, which begins in the foothills of Monticeto and winds its way up to the ridge of the mountains. Along the way we stopped several times to observe different layers of rock where they protruded from within the mountains. The Santa Ynez mountains are composed primarily of sandstone and shale. The sandstone is relatively hard and tends to form peaks, while the shale is softer and erodes more easily. An overview of our route. Route overview, including return trip. Speed/Elevation Profile: Speed is purple, and elevation is in red. The Sespe Sandstone Formation - a reddish sandstone with lots of rocks and pebbles mixed in. The Cozy Dell Shale Formation - very soft shale which would crumble in one's hand. Matilija Sandstone - like the coldwater sandstone, but with more shale mixed in. Juncal Shale - Another bed of soft, crumbly shale. The rock layers formed due to rising and falling ocean levels. High ocean levels deposit fine silt, which becomes shale. When the ocean was lower, layers of sand would be deposited over the silt, forming sandstone. The layers of rock were flat until about 1.5 million years ago, when movement along the San Andres fault squished the rocks and bunched them up into mountains. Its crazy to think that rock in these ~4,000 foot high peaks formed under water originally. A view of our route looking north. At our first stop we viewed the Sespe sandstone formation, along with some 'fanglomerate' which is comprised of sandstone which had erroded from the peaks and ended up at the bottom of a valley. The ridges surrounding this valley have since eroded away, leaving the fanglomerate perched up on a ridge. Cozy Dell Shale near the 'No Shooting' signs on Gibraltar road. The sandstone formations are much harder and therefore form the peaks of the mountains. Areas comprised of shale are soft and erode into valleys. These alternating bands of shale and sandstone help explain the formation of the moutain's topography. View from the Coldwater Sandstone pin, looking west. We stopped to view the coldwater sandstone formation from a distance. The above image is the view we saw; notice how there are two peaks with a valley inbetween. The peaks are both comprised of sandstone while the valley is mostly shale. is visible in the valley. We ended out trip at La Cumbre peak, the highest peak in the mountains, where we had a terrific overview of the terrain we had just driven through up close. The view from La Crumbre Peak, looking East. A good portion of our route is visible. 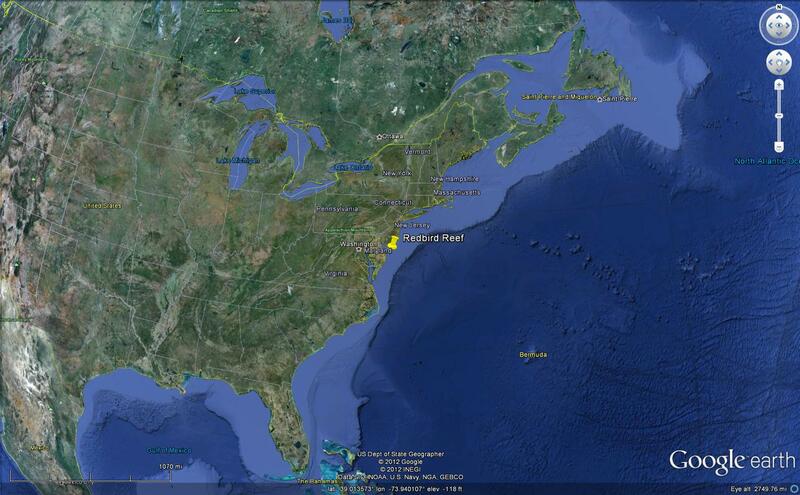 Here is an interactive map of our route. 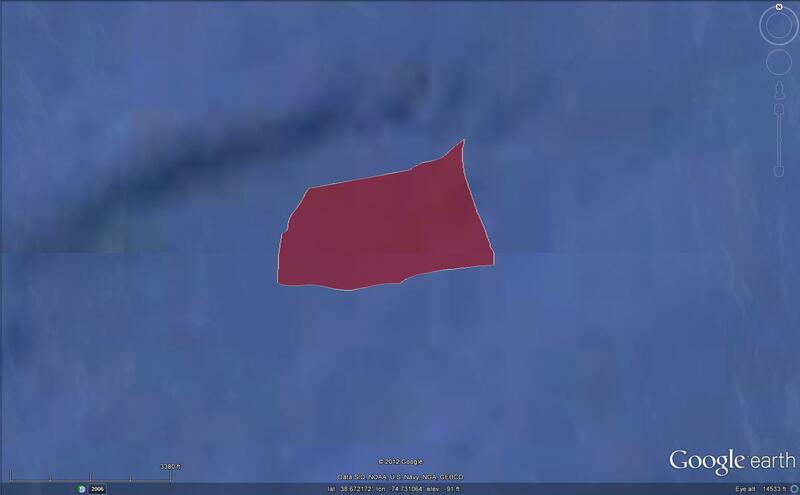 If you zoom in, you can see areas where there appears to be lots of frantic running around. These areas are where we stopped and got out of the vans to walk around, and the GPS unit recorded my movements as I examined the rock formations! The Santa Barbara County Association of Governments (SBCAG) recently introduced SBroads.com, a site which provides real time traffic information for towns between Goleta and Carpinteria. The site's interactive map shows current traffic conditions on the 101 freeway, and markers on the map display the location of any accidents, roadwork, or other incidents which may affect traffic. Additionally, users can also view one of seven live traffic cameras up and down the 101 freeway in Santa Barbara and the Goleta Valley to see what traffic looks like in real time. Travel time estimates are provided based on current traffic conditions as measured by roadway sensors, and traffic incidents and sigalerts are provided by the CHP for display on the traffic map. Estimated travel times are calculated and displayed. Construction of HOV lane between Santa Barbara and La Conchita. Widening of the US 101 Santa Maria River bridge. Addition of passing lanes to HWY 246 between Solvang and Buellton. Click any of the following links for more info about Regional Transportation Projects, 101 Freeway Widening, and the latest news and updates. And of course, for up-to-the-minute traffic conditions, be sure to visit SBroads.com! The Delaware Department of Natural Resources and Environmental Control has taken an innovative approach to manage the ocean's reefs. Artificial Reefs have long been built out of left over tires and cement blocks which are dropped in the ocean, but Delaware wanted to build a reef of a larger magnitude. Starting in 2008, a contractor has been dumping retired subway cars from New York City into the ocean eighteen miles off the Atlantic Coast, forming the Red Bird Reed. The subway cars make great homes for fishes of all kinds, and allow life to flourish in what was previous a barren stretch of sea floor. The subway cars are heavy enough that they will not move once dropped in the water, and New York City provides the retired cars for free. As the Red Bird Reef project grows in notoriety, demand for the retired subway cars have shot up. An article which ran in the NY Times in 2008 stated that other organizations were seeking the cars to build reefs. New York State itself is in the process of renewing its permit to build artificial reefs; one the state has secured this permit, the supply of subway cars is expected to dry up. The subway cars attract all sorts of marine life, including tuna, mackerel, sea bass and flounder. Each fish prefers a different spot in the car, allowing them to co-existing, and the cars are durable enough that they will last for decades. My girlfriend Shoree and I recently celebrated our one year anniversary, and being the modern woman that she is, Shoree insisted on taking me on an overnight getaway to celebrate. She told me she'd book a hotel, but that she wanted to keep the exact location a surprise. 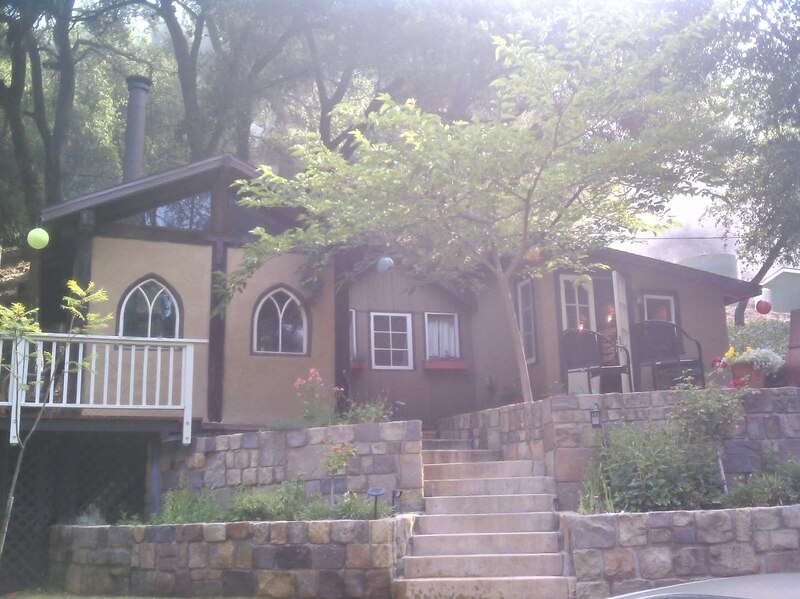 I figured we would be going to a nice bed and breakfast in Santa Barbara or Solvang, or something else simple and affordable. The day of our trip finally arrived; I was driving, and Shoree was giving me directions to the hotel. She directly me up Hwy 154, and I thought to myself "Ok, we're going to Solvang." You can imagine my surprise when I was told to turn right up Painted Cave Road, and I realized that Shoree had something much more special in store for me than just a hotel. After a few miles we turned off Painted Cave Rd onto a private road which narrowed and quickly became quite bumpy. The trees overhead grew thick, giving the feeling of driving through a tunnel, as anticipation grew in my mind about where we were going. We pulled up to an opening in the forest, and Shoree announced "This is Headwaters Ranch, and we will be staying in their guest cabin tonight." My mind was blown! 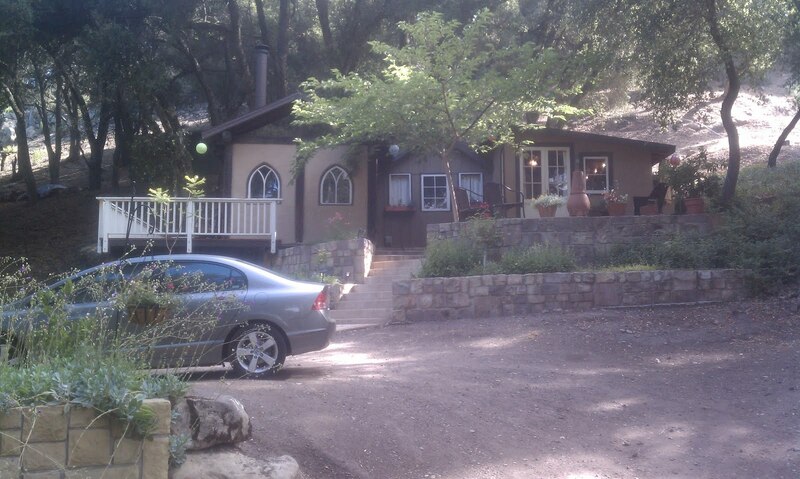 I never expected that we'd be staying in a cabin tucked away in the beautiful Los Padres National Forest. 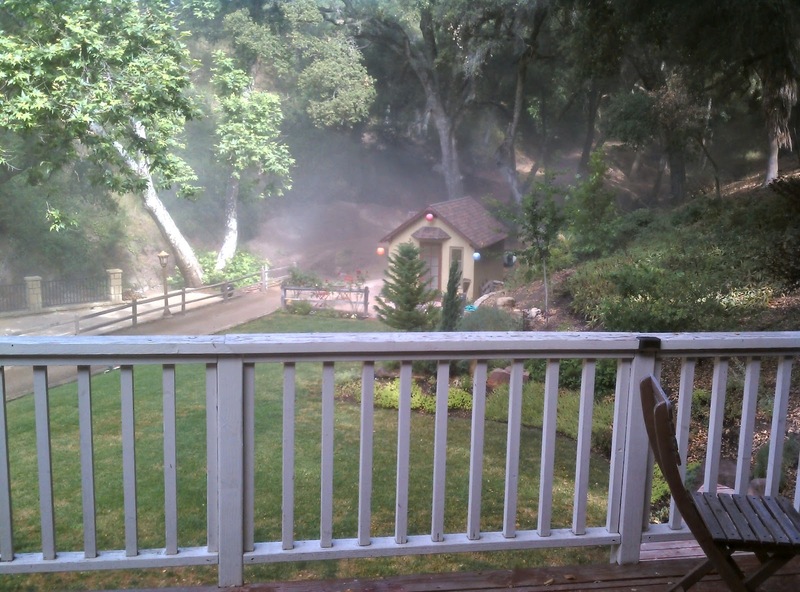 The ranch is owned and occupied by Jim and Cathy who advertise their guest cabin for rent via craigslist and their website. Jim greeted us in the driveway as we pulled up, and directed us to a driveway in front of the guest cabin. He then took us inside and showed us around in what was the cutest cabin I have ever personally seen. This cabin is around 100 years old, and was originally built to house miners working at a near by quarry. Despite it's age, the place was very comfy and welcoming; it was clear that someone had put a lot of love into fixing the place up, and every detail was meticulously attended to, as one would expect from a luxury vacation home. fireplace, and comfy seating to enjoy the view. Guest Cabin Back Deck, off of the living room. The cabin feels spacious with lots of natural light. 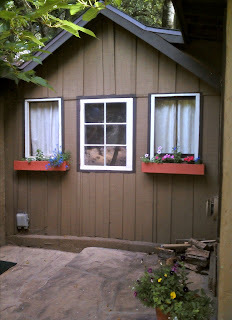 The doorway from the patio leads into the beautiful, recently remodeled kitchen. Off the kitchen is the bedroom and bathroom, and on the other side of the bedroom is the living room which has a wood burning stove and giant windows looking out on the creek below. 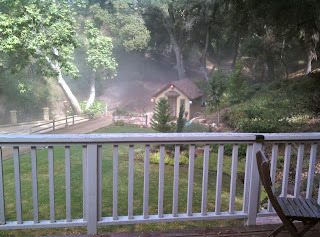 View of the driveway and cabin. 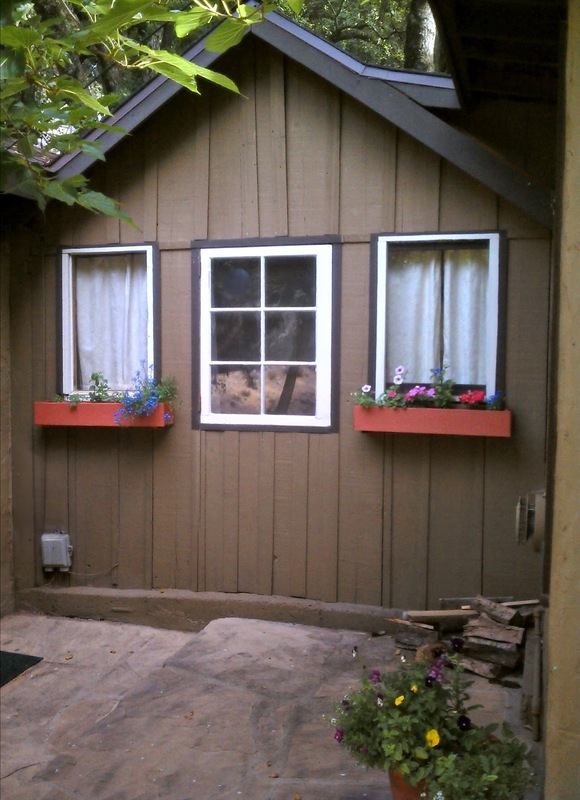 The cabin has beautiful landscaping and is tastefully decorated. I felt right at home, and did not want to leave after our stay! 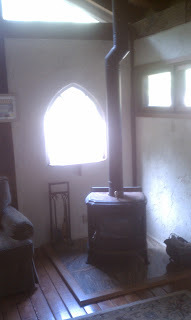 Wood Stove in the living room. Firewood is provided! 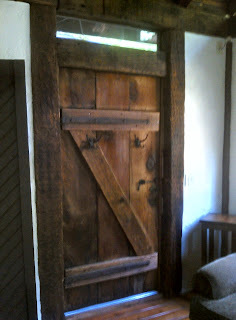 The original entrance door added a very quaint touch. Headwaters Ranch has many miles of hiking trails which guests can use. The terrain is relatively steep, so be sure to bring good hiking shoes, but the views are breathtaking and Jim takes great care of the trails. 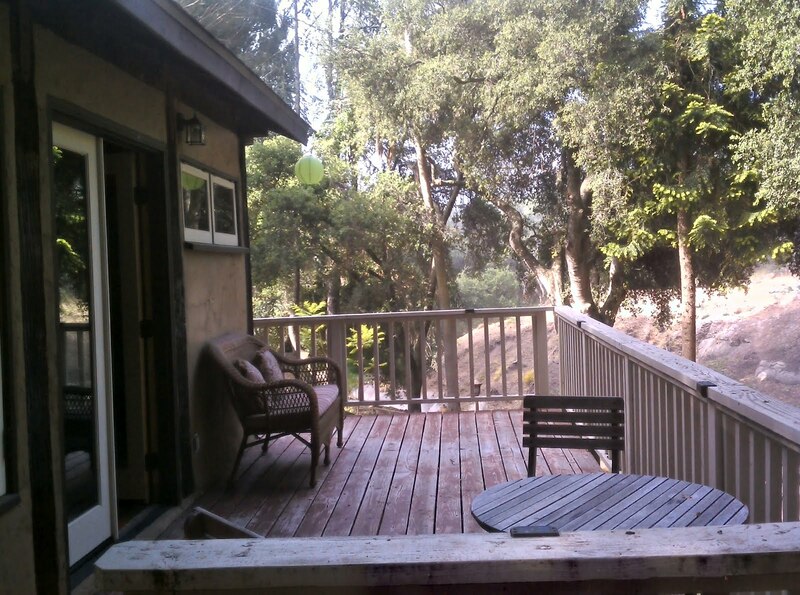 The cabin seems very remote, but it's less than twenty minutes from Downtown Santa Barbara and the Santa Ynez Valley, so there is pleanty to see and do during the day before returning to this lovely hide-a-way at night. 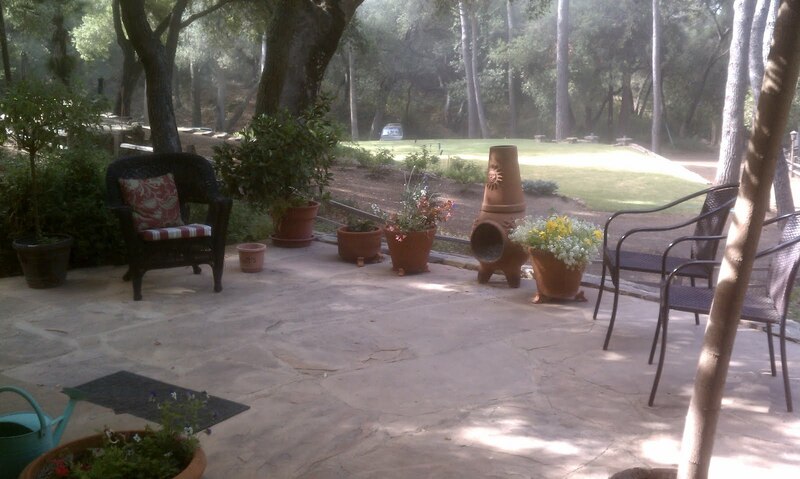 The next time you need some time away to relax and take in nature, grab a loved one and head up to Headwaters Ranch (after making a reservation, of course) for a taste of life at a slower pace. 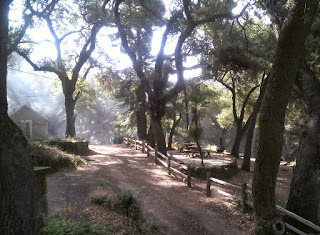 For more info, visit the ranch's website. Here you can read about the ranches history, view more photos, review rates and booking info. Jim and Cathy are old school, however, so to make reservations you will have to give them a call. Please explore the interactive map of our drive to the ranch. I recorded our path (the brown line) using my handheld GPS receiver. The Straight of Hormuz has long been a controversial water through which a large portion of the world's oil must be shipped. Adjacent to Iran, the waterway is known around the world as a battleground in which western nations try and protect the shipment of oil from the Middle East to global markets while Iran tries to limit these exports to gain leverage in it's struggle for a space on the world's stage. The location of the Straight of Hormuz (A). In a move seen as retaliation for the EU's recent increased sanctions, Iran's Parliament has drafted a bill which would prohibit oil shipments in the Straight of Hormuz to nations imposing the sanctions. The body of water is a strategic shipping channel by which oil is moved from Saudi Arabia, Iraq, the UAE and Syria to consuming nations around the world. depicted in an Arab Political cartoon. 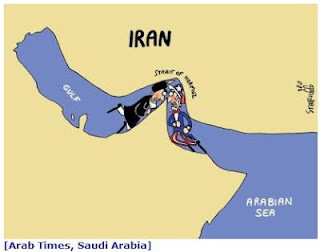 If Iran's government is successful in it's desire to close to the waterway to oil shipments going to countries which have imposed an embargo, the world oil markets may react violently as more oil is made available to Iran's allies while less is available to western countries. War hawks here in the U.S. are likely to use Iran's shipping prohibition to continue beating the war drum, saying that we need to protect our 'strategic interests' in the Middle East. In this case, 'strategic interests' refer to freely flowing oil. I hold out hope the U.S. and E.U. have the common sense to 1) recognize Iran's legitimacy as a sovereign nation state to control it's land and water, and 2) pursue a diplomatic solution to what is likely to be perceived by the west as another Islamic threat.